How do I set up Autodeposit for INTERAC e-Transfer? Autodeposit is a feature of the INTERAC e-Transfer service where you can register to have funds directly deposited into your bank account without having to answer a security question. Log in to online or mobile banking and navigate to Transfer Money on the left menu. Select “Autodeposit” from the menu near the top of the page. Enter your email address and link your account. Any transfers to the registered email address will be automatically deposited into this account. You can register up to 5 different email addresses to direct funds into different Vancity accounts. Open the Vancity Mobile app. Enter your email address and link an account. Any transfers to the registered email address will be automatically deposited into this account. You can register up to 5 different email addresses to direct funds into different Vancity accounts. Why do I have to consent to my name being associated with my account when I sign up for Autodeposit? 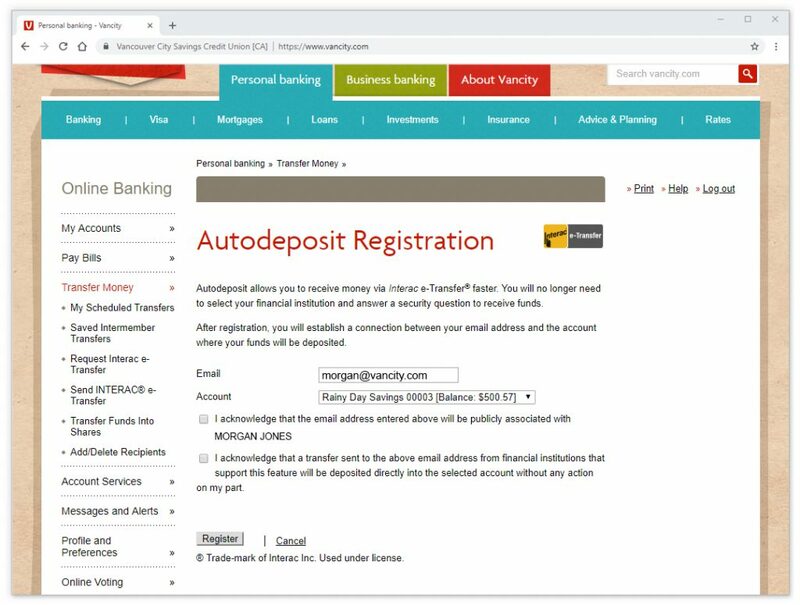 Once you have registered for Autodeposit with, the name you used to create your profile within INTERAC e-Transfer settings will be displayed to anyone who sends you an e-transfer. If I sign up for Autodeposit, how will I know when I’ve received an INTERAC e-Transfer? You will receive a notification by email every time that you receive funds through the Autodeposit feature. This email will let you know that money has been deposited into your bank account and will provide any details associated with the transfer.